What is a network connection. A network connection can take many forms. It can be a network card, a network adapter, a network interface card (NIC) or a LAN adapter. These are all pieces of computer hardware that are made and designed to communicate over a network of computers. They provide two layers of security. The first is an OSI layer 1, which is a physical layer of security. The second is a layer 2 device, which provides data security. The former provides access to a literal networking medium, and the second provides a low level of data security through a MAC addressing system. A basic network card allows users to connect via cables or without any physical wire. While there are a variety of hardware services available for network connections, the most common is the Ethernet card. Every Ethernet network card contains its own unique 48-digit number. This is stored on Read Only Memory on every card. Every card on an Ethernet network is required to have its own MAC address. Most card vendors will purchase large blocks of addresses from the Institute of Electrical and Electronic Engineers. Each card will be given a unique address to ensure that no two cards have the same address. 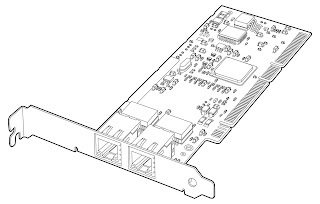 While historically network cards needed to be programmed into the bus of the computer, the low cost of Ethernet cards has rendered them ubiquitous in modern technology. Most Ethernet cards use at least one of four ways to verify transferred data. Polling involves using the microprocessor to examine the peripheral system that is being controlled. Programmed I/O uses the systems address to the peripheral’s bus to create an action. Interrupt driven I/O lets the peripheral component lets the central processor know when it is ready to send data. Finally, a process called DMA allows a peripheral component to access the central processors memory, letting it monitor itself.